We're not just experts in our field, we're Guardians of Childhood. We're closer than you think! 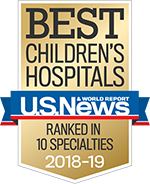 St. Louis Children's Hospital is committed to providing access to world-renowned care for children all across our community.